The Malevolent Grain EP is available only on vinyl, and if you get the chance to hold it in your hands, you will understand why. I don't have a turntable but I feel like I got the Wolves In the Throne Room experience just by looking at it. The rich greens and browns of the cover's forest imagery feel immersive on such a large canvass. That couldn't happen with CD artwork. Aesthetically, I much prefer WITTR's illegible old logo, but the new one allows for a richer gilding of gold foil. Was this the intent behind the change, or did the band figure that a readable logo would increase its marketability? It's not impossible to conceive of WITTR appealing to the same audience that cries at Explosions In the Sky and Mogwai concerts. With each release, WITTR's relationship with traditional black metal becomes ever more tenuous, their emphasis on large-scale grandeur over the immediate payoffs of metal increasingly resolute. 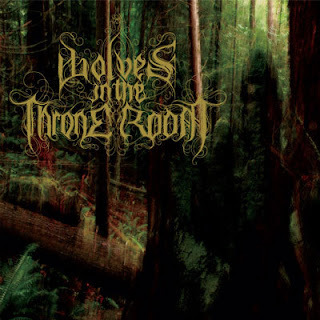 "Staring onward, as time stands still" sings guest vocalist Jamie Myers (a former member of Hammers of Misfortune) on Side 1, "A Looming Resonance." It's a great description of what WITTR are doing here. Large portions of Malevolent Grain are harmonically static -- just two chords alternating back and forth, the band's guitars (played in part by new member Will Lindsay, formerly of Middian) blurring into a cloud of muffled electricity. Only at the eight minute mark do the song's dripping harmonies explode into scorched blastbeat terrain. This is black metal focused on process and growth. I'm reminded of my favorite Sonic Youth track, "Theresa's Sound World" from Dirty (1992), and that's a very, very good thing. Side 2 of Malevolent Grain, "Hate Crystal," hurls right out of the gate with racing blasts, tremolo guitars and Nathan Weaver's high-pitched imprecations. Still, this is far from extreme. WITTR aim not to pummel but to blanket with repetition and texture. You get the sense that this song has always been playing, and that producer Randall Dunn happened to hit "record" for the isolated 11-minute segment that is captured on the record. It's about right that "Hate Crystal" dissipates into electronic drones and clattering percussion instead of ending properly. This music is elemental, subject to the same natural forces as trees, rivers, flesh. Nice EP, love the cover. Evocative of a malevolent Sasquatch? I dunno about those female vox, but that packaging is something else. Cosmo - I wasn't that impressed with Jamie Myers' wavery vox...not as powerful as I would have wanted. Jessika Kenney's on Two Hunters were better. Black Cascade gets my thumbs up though.